Note to readers: Fox is throwing a big televised party for itself Sunday (April 22nd, 7 p.m. central) to celebrate its 25th anniversary as a national broadcast network. They're a bit late. 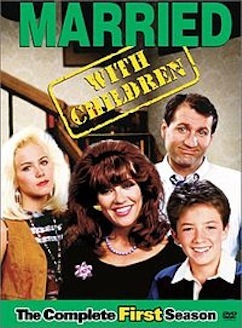 Fox actually launched on Sunday, April 5, 1987 with the premieres of Married . . . with Children and The Tracey Ullman Show. I've been covering Fox from its very beginning, dating to the time when its owned-and-operated station in Dallas was KDAF-TV (Ch. 33) rather than KDFW-TV (Channel 4). This article, first published on April 3, 1987, looks at both the initial expectations for the network and some of the detractors who pretty much discounted its chances of ever being a prime-time force. A quarter-century later, Fox again will finish this television season as the No. 1 network among advertiser-craved 18-to-49-year-olds. 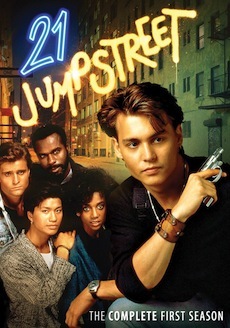 It's come a long way since a young unknown named Johnny Depp starred in Fox's first drama series, 21 Jump Street. The Fox network enters the lions' den Sunday. Will it become a different animal with a sharp bite or a sacrificial lamb to be carved during the Easter season by the friendly cutthroats at NBC, ABC and CBS? For now, there is only euphoria at Fox. "Our stations are walking around with their heads in the clouds in excitement about this venture," says Jamie Kellner, president of the Fox Broadcasting Co. Equally enthusiastic is Ray Schonbak, general manager of KDAF-TV (Channel 33), one of seven stations owned and operated by Fox. "I think Fox is going to allow us to grow more rapidly than anyone else in this marketplace," he says in an interview. "Of all the stations in the market, no one's willing to take greater risks than us. Everyone else is too busy trying to protect something. They're afraid to face the future. But they'd better. They'd better start looking at it." Such talk doesn't come cheap. In the short-term future -- for the next five years -- Fox is prepared to lose $150 million or more in its bid to become a competitive alternative to what Fox chairman Barry Diller calls the "big elephant networks." The money will come from the seemingly bottomless pockets of Rupert Murdoch, the print baron who is indulging his interest in American television. Murdoch owns the 20th Century-Fox studios and television stations in Dallas, Houston, New York, Los Angeles, Chicago, Boston and Washington, D.C. Equally important, Fox has two-year contracts with 105 stations covering about 85 percent of the country. This brand new grouping of affiliate stations will receive cash compensation payments in return for carrying the Fox programming lineup. The arrangement, identical to that of an ABC, NBC or CBS station's relationship with its network, is a giant step beyond any other dreams of a "Fourth Network." In the next two months, Fox will join the prime-time ratings race with six comedies, three dramas and a determination to build a foundation of young, "upscale" viewers. The first two half-hour comedies, Married . . . with Children and The Tracey Ullman Show, premiere Sunday in an "open-house" environment. Each show will be telecast three times, allowing audiences to watch it after watching favorites on the other three networks. By June 6, Fox plans to have five hours of prime-time in place, from 6 to 9 p.m. Sundays and from 7 to 9 p.m. Saturdays. Sundays will come first, with a regularly scheduled lineup of 21 Jump Street, Married . . . with Children, Duet, Mr. President and The Tracey Ullman Show fully in place on the night of May 3. The initial nine series will be short on star power but long on behind-the-scenes creativity. Most viewers will recognize only the names of George C. Scott, star of Mr. President, and Patty Duke, who plays a 40-year-old woman attracted to a 28-year-old man in Karen's Song. "The stars at the network really are the producers and writers who create the series for us," says Garth Ancier, the 28-year-old vice president of programming for Fox. To that end, The Tracey Ullman Show is produced by Jim Brooks, the Oscar-winning director of Terms of Endearment and a producer/writer on esteemed television series such as Taxi, The Mary Tyler Moore Show and Lou Grant. Ullman is a British comedian/actress who has made several well-received appearances on NBC's Late Night with David Letterman. Gary David Goldberg, whose UBU production company makes NBC's Family Ties, is involved with the romantic comedy Duet for Fox. Stephen J. Cannell,who created The A-Team for NBC, is producing Fox's only one-hour show, 21 Jump Street, an action-adventure series about police who "infiltrate circles of high school criminals." Mr. President has Ed (Taxi, Amen) Weinberger and Gene (M*A*S*H) Reynolds working behind the cameras. Skeptics of such pedigrees include Brandon Tartikoff, NBC's president of entertainment and Ancier's boss during his six-year stay at the network. "They have the fingernail on Jim Brooks' left pinky," Tartikoff says. "People like Brooks and Goldberg are not going to give their lifeblood to a program that is going to be seen in about 80 percent of the country on mostly UHF stations. They're buying marquee value, but it's going to come down to who's really going to do the show every week." "I can't imagine that Tartikoff would say that," Fox chairman Barry Diller retorts. "Jim Brooks will not allow his name to be on anything unless he has a kind of maniacal involvement." Also skeptical of Fox is Grant Tinker, who as chairman of NBC led the network from last to first in the prime-time ratings before resigning last year to return to television production. "I'm not at all convinced it will work," he told television critics during a recent press conference announcing his new partnership with the Gannett Co. "The Joan Rivers thing would give me pause. I'm wondering, even with all that good creative input, whether they'll make it. But I'm not much of a seer." "The Joan Rivers thing" is a touchy point with Fox executives. They take issue with reports that The Late Show with Joan Rivers has been a ratings failure since premiering Oct. 9 as Fox's first offering to affiliates. The Rivers show has averaged a 3.3 rating nationally, lower than the 4.0 rating projected by Fox, Kellner says. But Rivers supposedly is a hit among 18-to-49-year-olds, the principal target of most advertisers. "Fox is not trying to be No. 1," Kellner says. "We're targeting that smaller, more desirable audience. Joan Rivers' audience is rich in all the most desirable demographics. Let NBC bulk up its late-night household ratings numbers with a bunch of older viewers." Locally, Rivers is averaging only about a 2.0 rating on Channel 33. But that's double the audience the station had for its expensive reruns of Dynasty at that hour. Still, Channel 33 has had a tough time attracting viewers in this market since signing on as Metromedia-owned KRLD-TV on July 30, 1984. Metromedia had visions of a fourth network, but its flops were legion. Thick of the Night, Rituals, Breakaway, The Jerry Lewis Show -- nothing worked. Metromedia eventually sold its stations to Murdoch. Channel 33 officially changed its call letters to KDAF and its allegiance to Fox on March 7, 1986. "Dallas is probably one of our weaker markets," Ancier says. "We're working very hard to get that station up to par with the other Fox stations." Schonbak, Channel 33's general manager, allows that "you always want to grow faster than you do. But we've come a long way very quickly in a very competitive market and in a tough economy." Schonbak's first major programming move under the Fox banner was to cancel the station's weeknight 7 p.m. local newscast, which was losing considerable money. A carefully spoken, bottom line-oriented executive, he becomes animated when asked about the new trio of cost-conscious businessmen running the three major networks. "I find it a little disheartening," he says, "when something like the sacrosanct news department is cut and people like Dan Rather get on the picket line and say the end is here. What does Dan Rather know about it? He's an anchorman, that's all he is. He doesn't deal with the operation of the business. He doesn't have the broad picture. He has one little area that he does. He sits in a chair in front of a camera and reads news . . . We are a business, and it must be looked at and run as a business first and television second. That doesn't mean that you do things less than what you should do." Asked to name Channel 33's major accomplishments in Dallas, Schonback emphasizes the station's relationship with advertisers. "Our people have become broader-based in market conceptualizations," he says. "The building and the moving of product is what we are here to do. We represent and we sell products through this medium, as well as entertainment. These are the people that underwrite the costs of entertainment product that we purchase to give to the public . . . I think we've brought the television market more alive, because we came in and they (other local stations) saw us as a viable threat to some of their dollars. And they started to react to that." Schonback says Channel 33 is projecting a 5.0 rating to advertisers for the first group of Fox prime-time series. No current series on Channel 33 has that high an average. Each rating point equals about 15,000 households in the Dallas-Fort Worth viewing area. Nationally, Fox executives emphasize that their "no-limo network" cannot be expected to match the ratings of the Big Three, at least not in the 1980s. Plans call for starting a new night of prime-time programming each year, with Fridays the next likely breakthrough in early 1988. The executives expect that younger viewers will switch to Fox first. In Ancier's view, "they're more used to being in an era where there are more viewing services available." "If you like to root for the underdogs," Kellner says, "I can assure you, you should be rooting for us."